The first customer has officially gone live on Airband’s new fixed wireless “superfast broadband” (30Mbps+) service in Shropshire, which forms part of last year’s new £11.2m Connecting Shropshire contract that will see the network being rolled out reach an additional 14,000+ premises by 2020. The contract was first signed in July 2017 (here) and will take place alongside the scheme’s existing deployments of FTTC/P technology with Openreach (BT), which together are working to ensure that 98% of premises (homes and businesses) in Shropshire can access a 30Mbps+ capable broadband service by around the middle of 2020. The first transmitter on Airband’s new network in the area was officially installed in December 2017 (here) and this was intended to serve 300+ premises around parts of the Sheriffhales and Shifnal parishes, as well as other communities further east (e.g. Tong). As a result it will not come as much of a surprise to confirm that the first customer connection has now also gone live near Shifnal. IT security manager Andrew Lee and his wife, Sulayma, who live in a tiny rural village, are the first to be installed with superfast broadband under the initial deployment phase. The couple say they’ve been awaiting faster broadband for four years. “We live in a tiny village with just 46 houses three miles from Shifnal, close to Cosford airbase but our communications have always been poor. 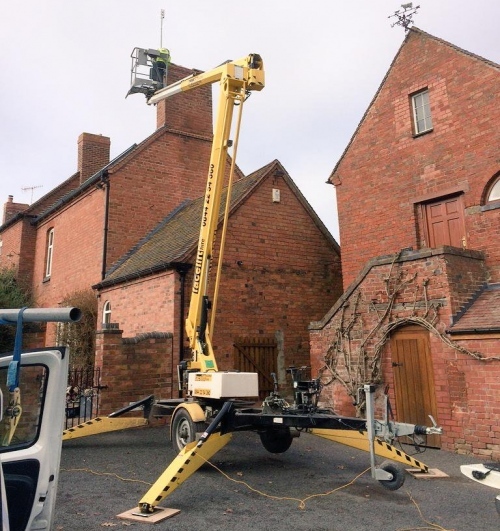 When BT upgraded the exchange in Albrighton it didn’t make any difference to us, so we were really keen to get a better connection with Airband. It’s a challenging location so installation wasn’t straightforward. I think this is because we are in a valley and it took a while to establish line-of-sight connection and also because our house is a listed building. They were very patient and thorough and to be honest I’m overjoyed with the results. “Rural Shropshire suffers with some of the poorest broadband speeds in the UK, and we are delighted to be playing a significant role in turning this situation around. This key milestone highlights the progress we’re making to help connect rural residents across the county. The new service requires that a small receiver is attached to individual properties, which enables them to connect to the Line-of-Sight (LOS) wireless network. Customers typically pay from £10 per month for a basic 30Mbps (2Mbps upload) service with a 10GB usage allowance, 12 month contract and £99 one-off installation fee. Meanwhile the top package costs £42 for an unlimited 30Mbps (4Mbps upload) connection. Very bad rip off pricing for Shropshire Airband £42 a month for up to 30Mbps download and up to 4Mbps upload with unlimited usage. FTTC with Plusnet is up to 40Mbps dowmload and up to 10Mbps upload with unlimited usage at cheaper £25 a month. (sighs) That’s a ridiculous comparison. The build costs of wireless as not the same as a fixed deployments. If you want to compare the (real) cost they would have to charge to bring FTTC to the same properties…. The Plusnet example is kind of pointless because the community members concerned claim they cannot access FTTC at even close to those speeds, which is the key point. Plusnet are piggybacking off an existing copper network and not building their own to serve isolated communities. £25 a month as long as you live in a “low cost area”. The areas to be served in this article probably won’t be “low cost” so even if FTTC was available it would be at least £32.50 a month. Still £42/month for 30Mb/4Mb fixed wireless isn’t too bad especially if it consistently keeps those speeds and doesn’t suffer badly from contention at peak time. What happens to the properties that don’t have line of sight? Hello, down here in not so Sunny Devon, in many areas (I.e. where we live) 2Mbs would be heaven, seriously, we are lucky to get 20kbs! LOS we are 2 miles from the closest BT cabinet, the route taken we are 6 miles and with drop off and especially at peak times we may as well give up on fixed Broadband. We have recently gone “mobile home router”, 4g, more expensive but we get a speed of 6 or 7mbs. So, if airband fancy a trip down here you would no doubt be welcomed. Devon is a complete mess, no doubt about it. CDS (Connecting Devon & Somerset) despite having by far the largest budget of any BDUK scheme are 2 years behind everywhere else with most of Phase 2. Around 11% of premises will qualify for USO as things currently stand, the national average is 2%.